We discussed all aspects of human and canine health including: weight control, supplements, alternate training, medical support, rehab, rest, etc. to keep you and/or your dog healthy. 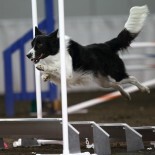 If you are a dog agility blogger please join us for future events!